Craving for chicken? 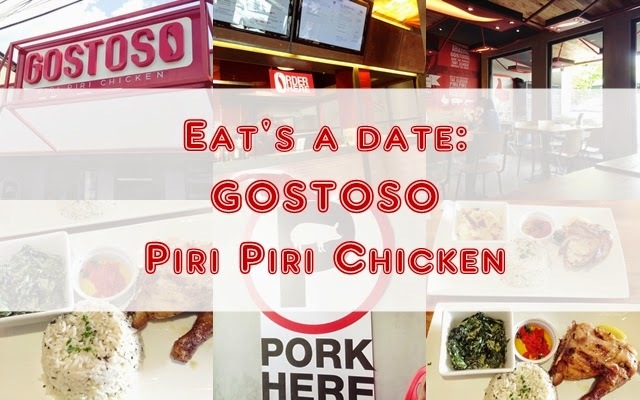 Why not try Piri Piri chicken from Gostoso in Kapitolyo, Pasig City? It is a small restaurant along the long stretch of Kapitolyo Avenue. Small but stylish! The chicken is amazing. The menu is on the screen. People can see how they prepare the chicken. The utensils and the chilly oil or Piri piri sauce. Charap! Our order. People can choose from different side such as creamed spinach, potato gratin, mac n' cheese, creamed corn and chick pea salad. Overall, I enjoy my delightful meal. It is very flavorful. I think the chicken for my taste was a little salty but the taste balances because of the side dish. Piri piri chicken is starting to be popular in our country lately. I think Filipinos are starting to like and love it. Have you tried this dish yet? What are your thoughts?